When I finally got around to making this baby food jar stash into a craft project, I ran into a problem. The clear plastic labels do peel off easily. Unfortunately, the glue used to adhere the label to the jar leaves behind a terrible sticky residue. I could not get the sticky residue off the baby food jars just by tossing the jars in the dishwasher, as I had hoped. And to just leave the glue on the jars on was not a good solution; it is incredibly sticky, so it collects dirt and hair like an icky magnet. Icky, sticky containers aren’t pretty or useful, so I was determined to find a way to be rid of the glue on all my little jars. 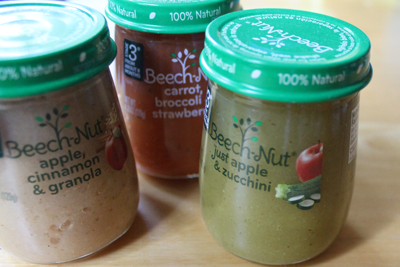 I tried all sorts of ways to figure out how to remove labels from Beechnut baby food jars. And, after a few experiments, I think I have found the best solution! It is easy, normally around the house and chemical free. What is this miracle solution? Plain old vegetable oil. It does still take a bit of elbow grease to get the gooey label residue off, but here’s what I did. And there are no harsh chemicals involved, so I didn’t have to worry about doing my project around the kiddo. I grabbed an old toothbrush, and a bottle of vegetable oil and got to scrubbing. Dip the toothbrush in the oil, scrub the residue loose, wipe with a paper towel or dry cloth, and voila, no more residue! Run the oily jars thru the dishwasher to get rid of the remaining vegetable oil, and you are ready to craft. I needed a new storage system for my beads, since I make jewelry. I re-purposed the baby food jars to store my gems and stones. To make them a little prettier, I got a bottle of teal spray paint (Rustoleum). A couple thin coats made the lids fresh and new, and I think this baby food jar craft project looks adorable siting on my shelf. You could make lots of cute things from the uniquely shaped Beechnut jars, just be creative and use them to fill a need you have. Check out and follow my Pinterest board, up-cycling baby food jars. Thanks! Glad you are enjoying!